We break down the answers to Frequently Asked Questions, to make it easier for you! Conveyancing is the term for the process required to effect transfer of ownership of property. It includes necessary checks and searches on the property and the preparation and lodgement of numerous legal documents at the Lands Titles Office. While the definition of conveyancing is simple enough, the fact that conveyancing is a legal procedure does introduce a number of complexities. Whether you are buying or selling a residential property, there are many traps for the inexperienced and unwary. Should anything go wrong or there be unforeseen delays, you want peace of mind that a proactive industry professional is looking after you and advising you of the legal implications. You can find out how much our services will cost by obtaining a quote here. Of course, every transaction is unique and therefore we encourage you to contact our office for a more detailed quote. We pride ourselves on ensuring all costs associated with the transaction are disclosed upfront. Can I choose my own Conveyancer? ABSOLUTELY. In fact, we encourage clients to do this! Do not be misled into thinking it is easier or cheaper to use “the Agent’s Conveyancer”. The best thing you can do is engage an independent Conveyancer who will look after your best interests. Are Tuckfields members of the Australian Institute of Conveyancers? We are. In fact, some of our conveyancers are active members of the AICSA committees. 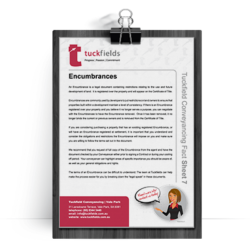 We also ensure all of our conveyancers meet their Certified Practicing Conveyancer Accreditation each year. You should always make sure your Conveyancer is registered and meets industry standards. Do you hold adequate Professional Indemnity Insurance? Yes. Which means if we are covered, then so are you. Do you have knowledge in several areas of conveyancing? Most definitely. As well as having residential experts on our team, we also have commercial and land division specialists. Discover other Tuckfield Conveyancing services: e-Conveyancing, Residential Conveyancing, Commercial Conveyancing, Lifestyle Changes and Land Divisions. We understand that legal terminology can be difficult to understand. Tuckfields have broken down the legal jargon into downloadable (PDF) fact sheets.